Mike Ullery | Miami Valley Today Troy Fire Department medics check out the driver of a car that jumped a curb and struck the Manpower offices in the 1800 block of West Main Street on Tuesday afternoon. Troy police are investigating what caused the driver to lose control and crash into the building. Damage to the building was minor. The car suffered moderate damage. The driver refused treatment at the scene. 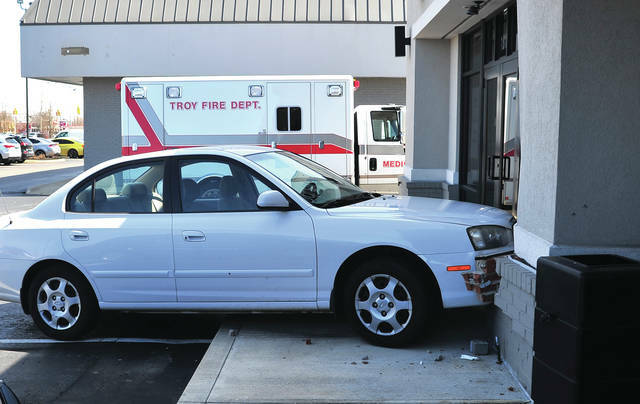 Troy Fire Department medics check out the driver of a car that jumped a curb and struck the Manpower offices in the 1800 block of West Main Street on Tuesday afternoon. Troy police are investigating what caused the driver to lose control and crash into the building. Damage to the building was minor. The car suffered moderate damage. The driver refused treatment at the scene. https://www.dailycall.com/wp-content/uploads/sites/30/2019/04/web1_040219mju_crash_troymanpower.jpgMike Ullery | Miami Valley Today Troy Fire Department medics check out the driver of a car that jumped a curb and struck the Manpower offices in the 1800 block of West Main Street on Tuesday afternoon. Troy police are investigating what caused the driver to lose control and crash into the building. Damage to the building was minor. The car suffered moderate damage. The driver refused treatment at the scene.